By contrast, Thursday night in Kansas City, the two best teams in the AFC square off in a game that could determine everything from the AFC West champion to the conference’s No. 1 seed to the Los Angeles Chargers’ sense of self-worth. The 11-2 Kansas City Chiefs, whose only two losses this year are on the road against the Patriots and the Los Angeles Rams (each by just three points), have beaten the Chargers nine times in a row, including in Los Angeles in Week 1 of this season. We were all so young and ignorant then. We had no idea that Patrick Mahomes had a great chance to throw 50 touchdown passes and be MVP of the league. We also didn’t know that the Chargers would lose only two more games before these two teams met again (one to those same pesky Rams and another, oddly, by one point at home to the Denver Broncos). The way it sets up now, it’s possible that the winner of Thursday’s game could have home-field advantage throughout the AFC playoffs while the loser could have the conference’s second-best record but be a wild-card team that has to play three road games to reach the Super Bowl. This is a big one, and there’s no point in trying to paint it otherwise. 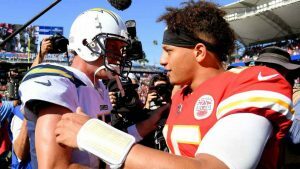 It was Week 15 last year when the Chargers, having recovered from an 0-4 start and won four in a row to tie the Chiefs (who had started 5-0) for first place in the division at 7-6, rolled into Kansas City for a Saturday night game that did not go their way. The Chiefs won that game 30-13 as Chargers quarterback Philip Rivers threw three interceptions. Kansas City went on to win the division. The Chargers finished 9-7 and out of the playoffs.